New publication: "Wladimir Köppen - Scholar for Life" - Deutsche Gesellschaft für Polarforschung e.V. 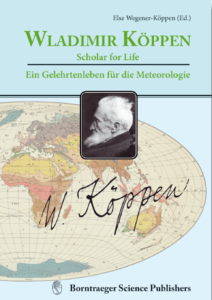 The new book „Wladimir Köppen – Scholar for Life“ has been published by Borntraeger Science Publishers. The book comprises the original German edition „Wladimir Köppen – Ein Gelehrtenleben für die Meteorologie“ as well as the complete English translation with an updated bibliography. The original German publication was edited by Köppen’s daughter Else Wegener-Köppen who married Alfred Wegener in 1913. Please see the Flyer as well as the link to the publisher’s website.